Happy Meal and I were at Legoland California........again, and we were in need of snacks. We had enjoyed some solid cheeseburgers at Ruby's Diner in the past. 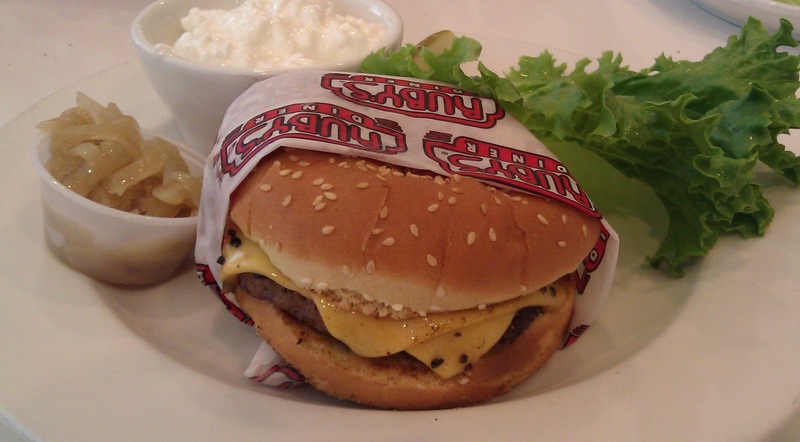 Ruby's Diner had swapped out the American Kobe Burgers with something new, Premium All-Natural Burgers. What, apparently, set these burgers apart from the others on the menu was that they were composed of Premium rather than Choice beef. This led me to believe that these particular, featured burgers would be in some way better. Better for me, that is. They were better for Ruby's Diner, since they were charging a premium price. The first attempt was a cheeseburger, which barely resembled what I had ordered, but this was resolved in a few minutes. Total wait time: 15 minutes. The Beef: The beef (Chuck) in the Premium All-Natural Burger was far less flavorful and far oilier than the standard burgers at Ruby's Diner. The burger was only mildly beefy. It had no trace of aging. The beef was oily, and I pegged the fat content near 30%. Overall, this was a bland, oily burger. The bite was firm but not chewy. The Sear: Ruby's Diner got half of a sear onto the burger patty. The ho-hum sear coupled with the lack of beefy flavors and seasoning made for an uninteresting and average-tasting cheeseburger. The Preparation: The beef was ground on the fine side of medium. The burgers were cooked to Well Done on a hot flat top. The patties were turned once during the cooking process. The preparation at Ruby's Diner was competent, but they were working with an dismally bland product. The patty was roughly 6 ounces. The patties were clearly mechanically formed and shipped to their final destination. The Cheese: Ah, American Cheese....what can't you do? The twin slices of American cheese on my burger were perfectly melted and lent all the savory and umami that they could to the otherwise flavorless patty. This was not enough to save the dish. The Bun: The seeded, standard burger bun at Ruby's Diner was perfect. It was fresh, moist, a little sweet, a little yeasty, and perfectly toasted. The bun lent a perfect crunch to the bite. The bun was a runaway winner. The Fries: Ruby's Diner took delivery of pre-cut, par-cooked, frozen, bagged fries, and they were fantastic. I snagged some of Happy Meal's fries, and I opted for the healthier cottage cheese option. The fries that I did savor were perfectly cooked to a crisp, golden brown on the outside, and the interior was positively creamy. The fries were a little under-seasoned, but the texture was wonderful. The Toppings: This fell completely flat. 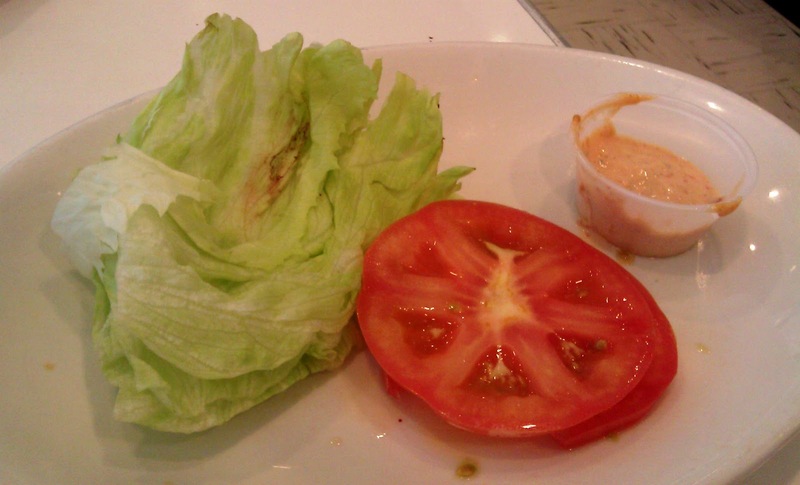 Both the Iceberg lettuce and the tomato slices had a sallow look to them. The lettuce was past its prime, and it was spoiled in one spot. The tomato was clearly under-ripe, and it had no business on a plate. The Value: The Premium All-Natural Burger came in at $9.99. This was 2 dollars more than a more flavorful and leaner burger with comparable toppings and sides. The value was weak for a dish advertised as Premium. I happen to like Ruby's Diner, and Happy Meal likes it, too. Sadly, the Premium All-Natural Burgers are over-priced, and they under-delivered. Go to Ruby's Diner, and enjoy a regular cheeseburger. Overview: Pass. 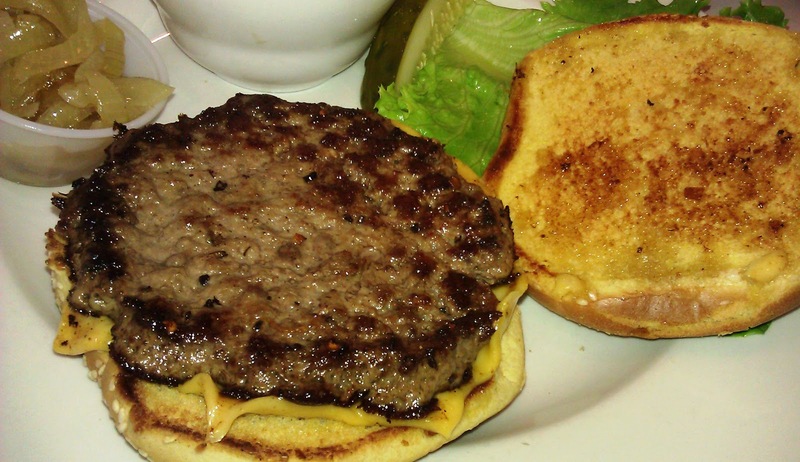 The Premium All-Natural Burger at Ruby's Diner was a pricy downgrade.